Some times in the name of creativity we need to challenger ourselves. This Sabzi Polow Mahi Tahdig is impressive visually and much to those who doubted my sanity it’s pretty tasty! 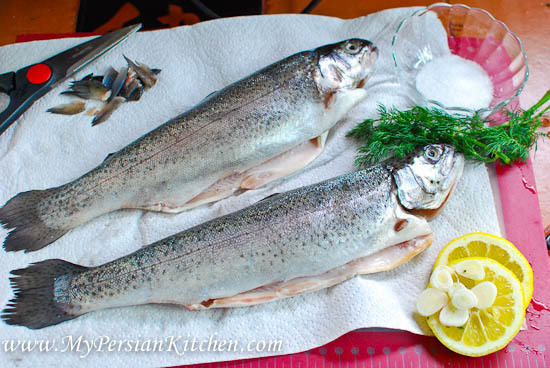 Last year I came across a Persian cooking video which inspired the Iranian Potato Salad that I posted. 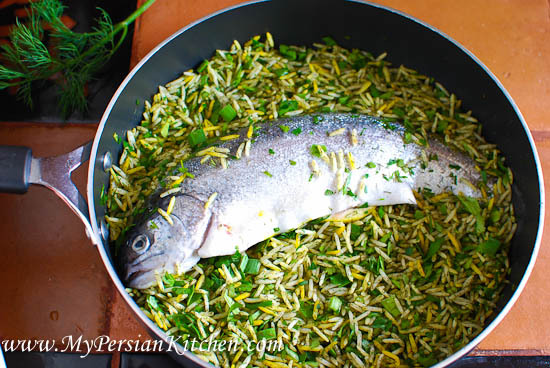 Within that same episode there was a quick mention about a Sabzi Polow, Persian Herbed rice, where the fish was cooked with the rice and was part of the tahdig. I was immediately taken by it and thought it was incredibly creative. I told myself that I was going to give it a try, and hopefully, post for Norouz this year. Between every day life ups and downs, and trying to gather up bloggers for our Norouz Recipe Round-Up I had forgotten about this recipe. Then I received an email from reader Bahareh who asked me if I had ever heard of Tahcheen Mahi. All of a sudden I remembered about the video! What do you know, the episode was pulled from YouTube. My first dilemma here the Tahcheen part as it is made with yogurt. The issue was the fact that growing up my Grandmother always said that fish and yogurt should not be eaten together because of the belief that one is Sardi, cold, and the other Garmi, hot. Because of they belong to two different groups they have the potential to upset one’s stomach. 1. It’s best to use a fish that is very fresh. 2. It’s best to use a fish that has been deboned. 3. It’s best to use a good amount of canola oil and butter! 4. It’s best to not move the fish too much once it has been placed at the bottom of the pot. 5. It’s best to use 2 pots: one which holds two fish and one that holds one. 6. 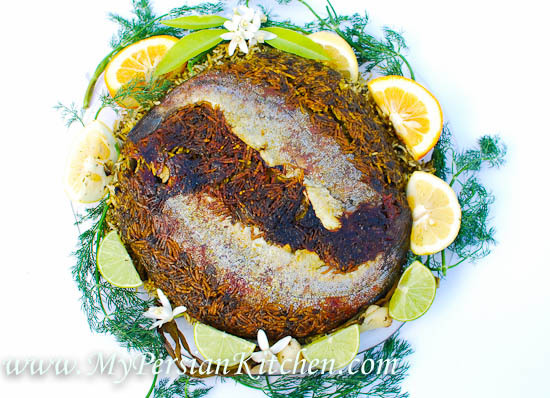 Flipping this rice in a cake form is a challenge because the fish makes the tahdig heavy. 7. 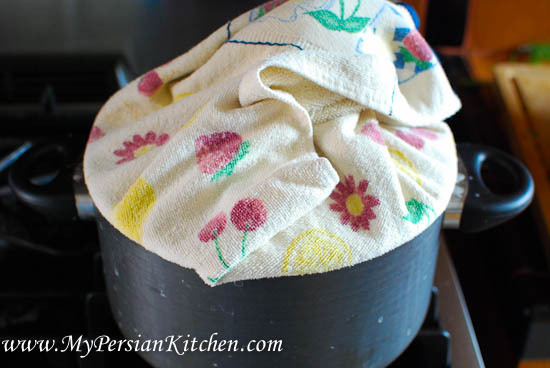 It’s best to remove the rice first then carefully lift the tahdig out of the pot. 8. If the head of the fish freaks you out, you have the option of only using the body of the fish. 9. 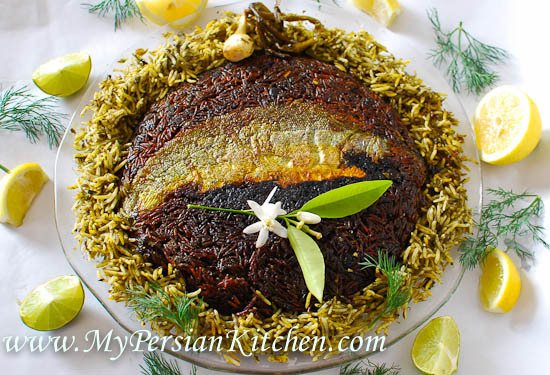 The rice does not smell like fish and it’s delicious as are the tahdig and fish! 10. The Sous Chef was impressed! First par-boil rice per Cooking Rice for Polow post. 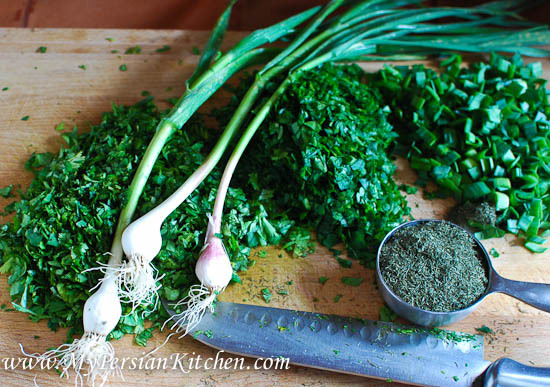 In the mean time rough chop herbs minus the fresh garlic. 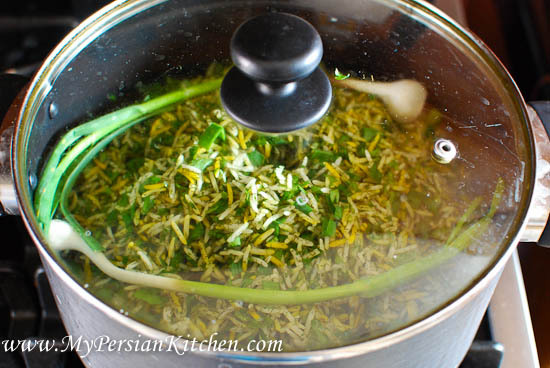 A few years ago I gave up layering Sabzi Polow the traditional way. I find that mixing the rice and herbs in a bowl makes life much easier. 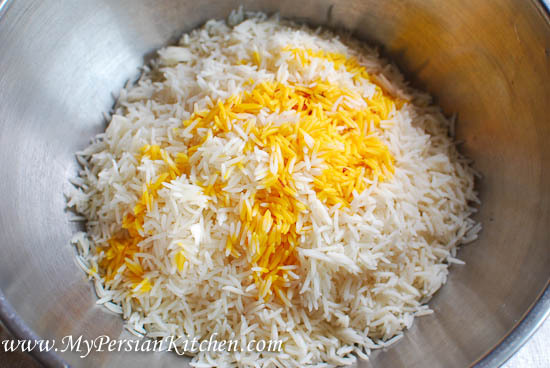 Place the thoroughly drained par-boiled rice in a large mixing bowl then add 3 tablespoons of brewed saffron. Mix gently to mix together. Add the herbs and 1 teaspoon of salt. 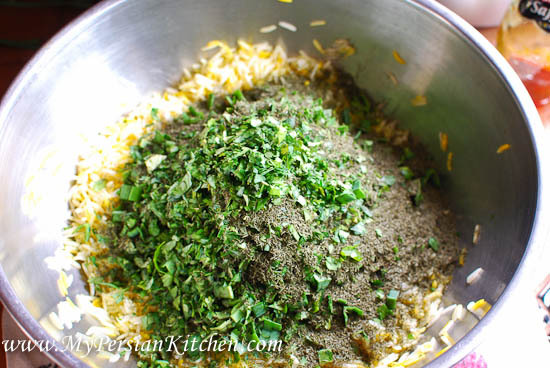 Toss gently so that the rice and herbs are mixed together. Wash and pat dry fish. With sharp scissors cut fins. Season the belly of the fish with salt, then stuff with slices of lemon and thinly sliced garlic. Finish off with a couple of sprigs of dill. 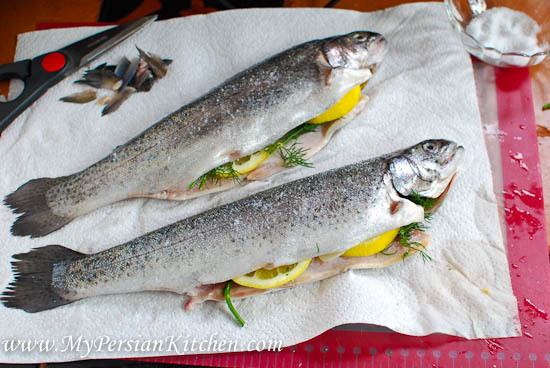 Add a small amount of canola oil to the upper side of the fish and throughly distribute with your fingers all over. Then season with salt and pepper. 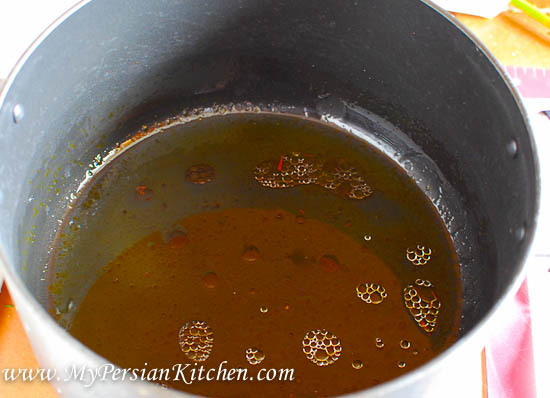 To a non-stick pot add 3 tablespoons of canola oil, 2 tablespoons of water, and 2 tablespoons of brewed saffron. With a spatula mix the liquid ingredients. 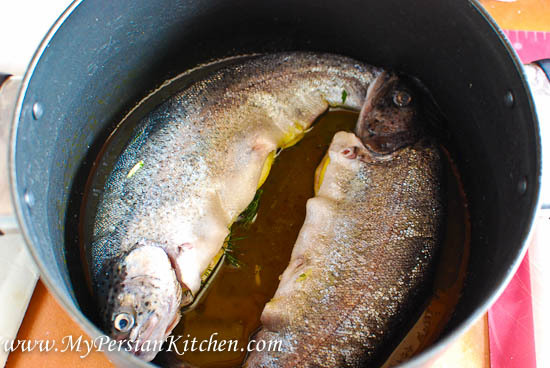 Carefully place 2 of the fish at the bottom of the pot, oil side down. Season the side facing up with salt and pepper. 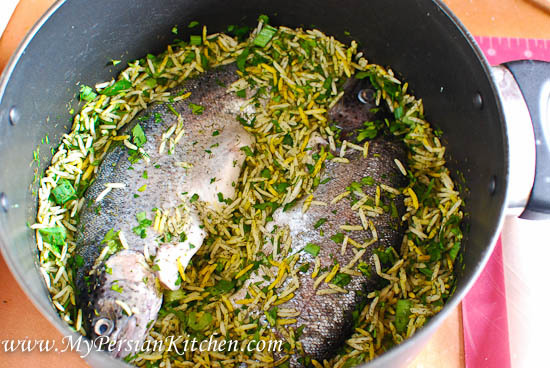 Add herbed rice and very gently press down the rice all around the fish. As I mentioned above, it helps to use two pots if the fish are too big for one pot. Load the rest of the rice in the pots. Create 5 holes with the back of a spatula then place fresh garlic on top of the rice, or in the middle section of the rice. Cover and cook on high for 10 minutes. Cut the butter into 6 pieces and place on top of the rice. Wrap the lid in a kitchen towel. Cook on low for 1 hour and 10 minutes. Serve with slices of lemon or lime! Very creative and impressive indeed! I never heard of this dish before, but it does remind me of a recipe I saw once in an Iraqi cookbook where a whole butterflied chicken was put at the bottom of the pot and then covered with rice mixed with chickpeas and a mixture of Middle Eastern spices. That dish turned out great, and I can’t wait to give your recipe a try. What a crazy idea! 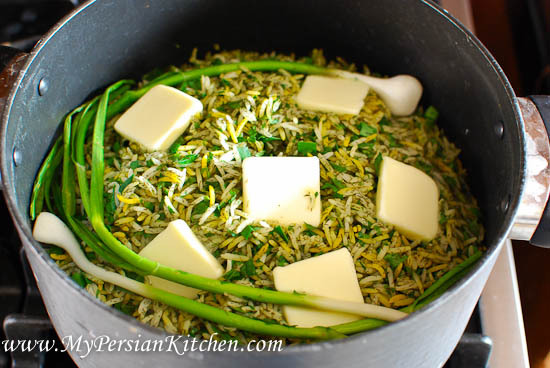 I love the spin on the classic norouz dish! holy moly! i thought i had had every kindof tahdig – but this is truly incredible!! IMPRESSIVE! Such a lot of work, taking photographs on top of that! wouldn’t it start splattering all over if you add water to oil? Mary, not if you don’t warm the oil and water, which is how I start mine. I am assuming that we use 6 T of canola oil? This looks incredibly dramatic and delicious! Thanks for the challenge. Hi, I have sabzi polow mix at home that I got from an Iranian store here in Montreal. What quantities should I use for this? Normally I would use the fresh veggies, but I kind of want to get rid of this first. Thanks! Matthew, when using dried herbs the recommended ratio is 1/4 cup dry per each packed cup of fresh.